I work at Walmart and we just got the new Funko Pop Vinyl figures in. They're the same toys that were unveiled at the New York Toy Fair earlier this year. I only saw Darkwing Duck, Launchpad McQuack, and Gosalyn in the shipping case. 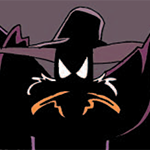 I know Negaduck was announced at Toy Fair as well, but I haven't seen him yet. It's so rare and exciting to actually see new Darkwing Duck merchandise in stores. Disney tends to ignore it, even when they produce merchandise that supposedly spans their history of animation (like the Tsum Tsum plush toys and figurines). Makes me happy!